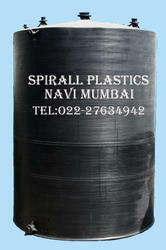 We are a leading Manufacturer of hdpe spiral tanks from Mumbai, India. We are the prepare of HDPE Spiral Tanks. Capacity ranging from 500 liters to To 40000 Liters diameter from 800 to 3000(standard diameter 800, 900, 1000, 1000, 1200, 1600, 1830, 2000, 2200, 2400, 2550, 2700, 3000mm) & height up to 5800 MM.